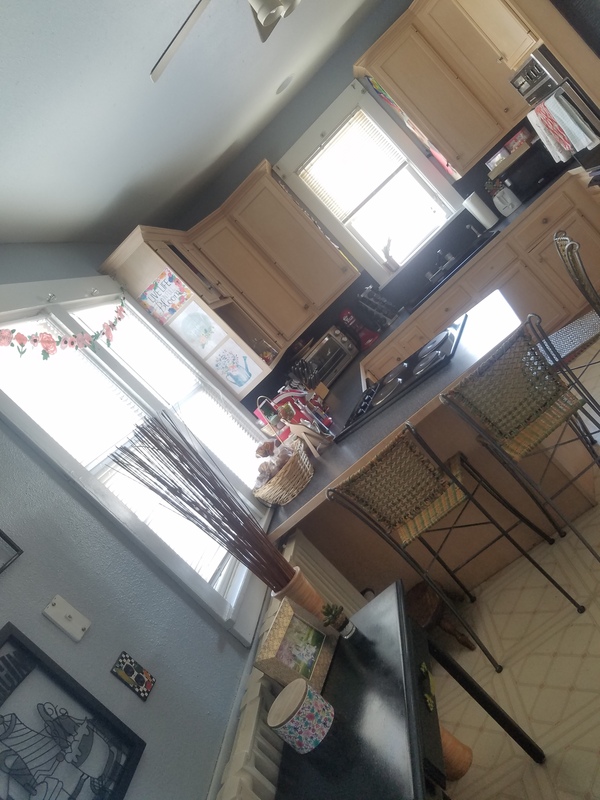 Does it look like Spring outside where you are? It definitely doesn’t look like Spring here. Last weekend there was a snow storm and we got 8.5 inches of snow. Just because it doesn’t look like Spring outside, doesn’t mean I can’t inside. 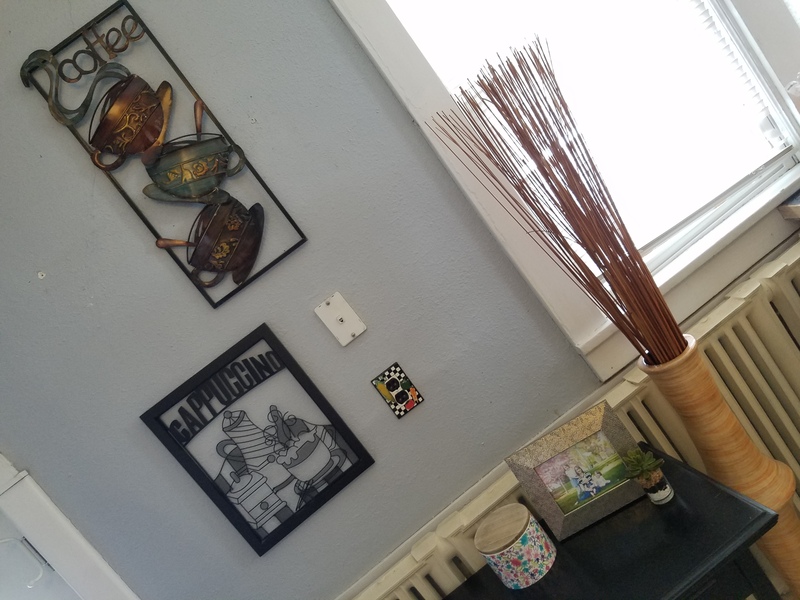 That’s why this weekend I decorated my home for Spring. 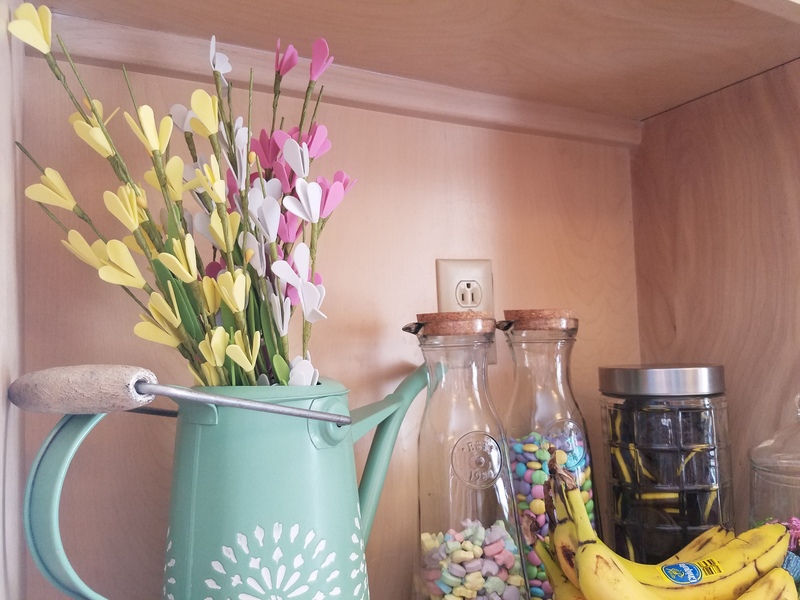 I thought I would start off by sharing with you my Spring decor in my kitchen. 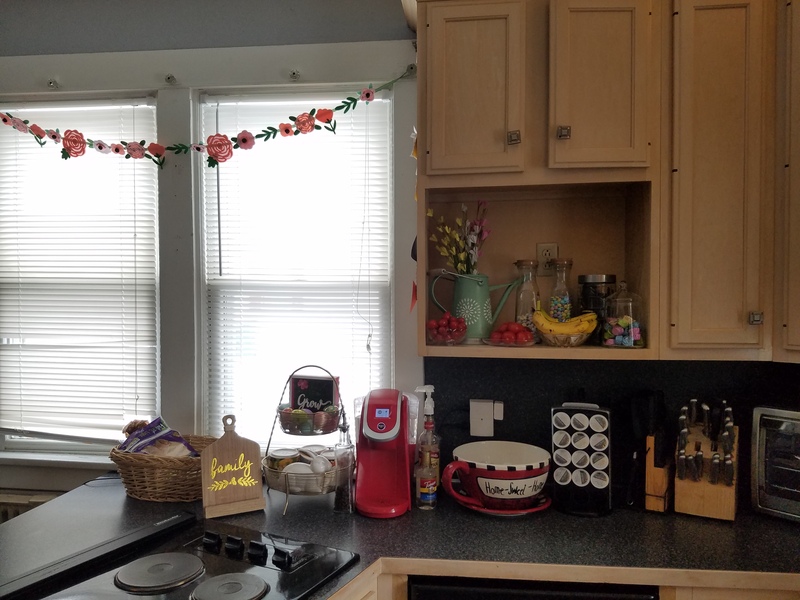 I love how my Spring decor turned out in my kitchen. 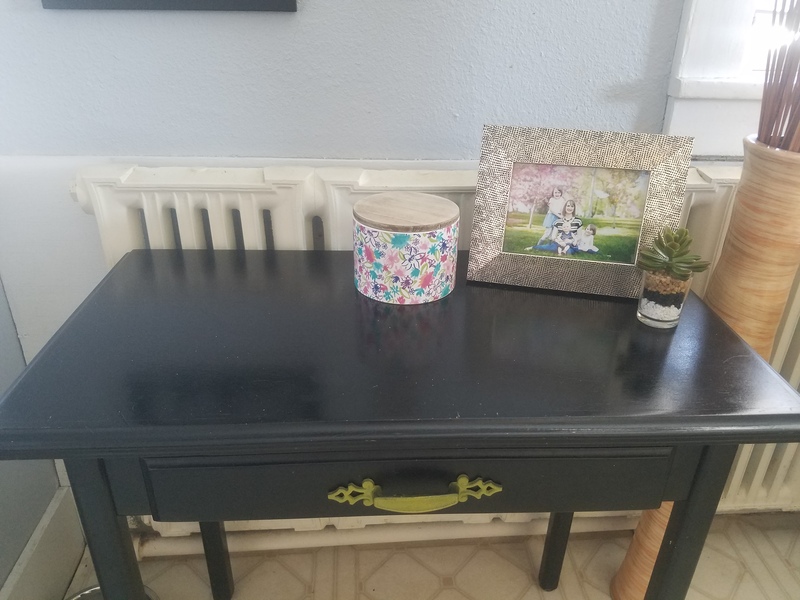 You can check out the Spring decor in the rest of my home here. 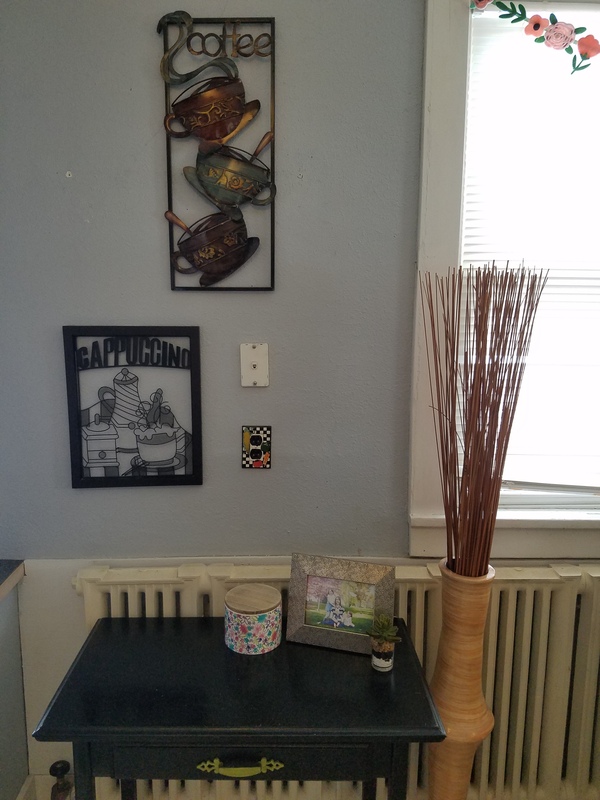 I bought several new items from Target (my favorite store) this year to add to my decor in my kitchen. I also used some items that I already had. 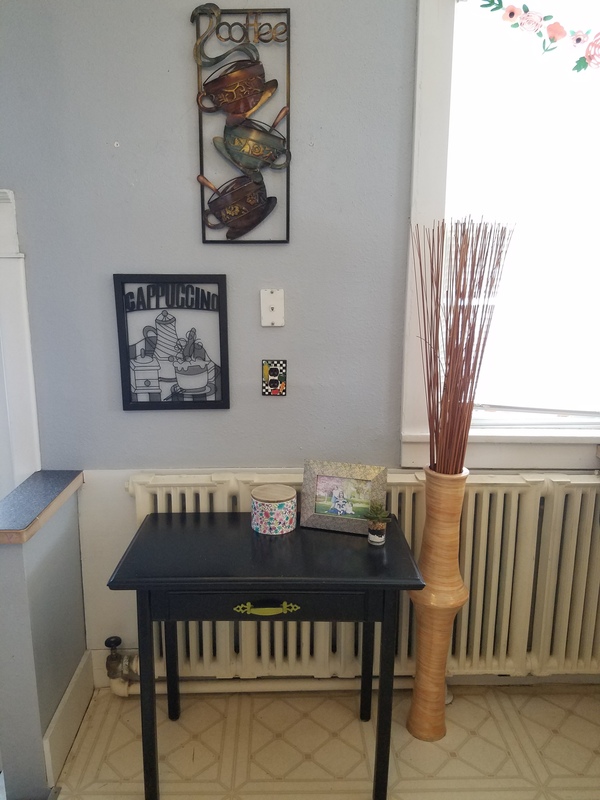 I moved my small black table into my kitchen that I had in my entryway. 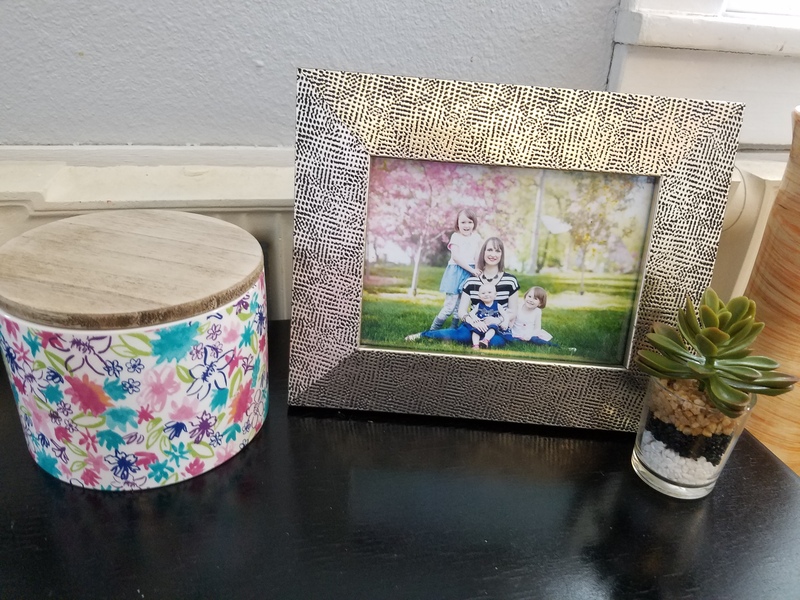 I added a picture taken of my girls and I on Mother’s Day last Spring. I found this floral canister and small plant in Target’s dollar spot section. The decor on the table is simple but yet perfect together. It only cost $8 to add the canister and small plant. 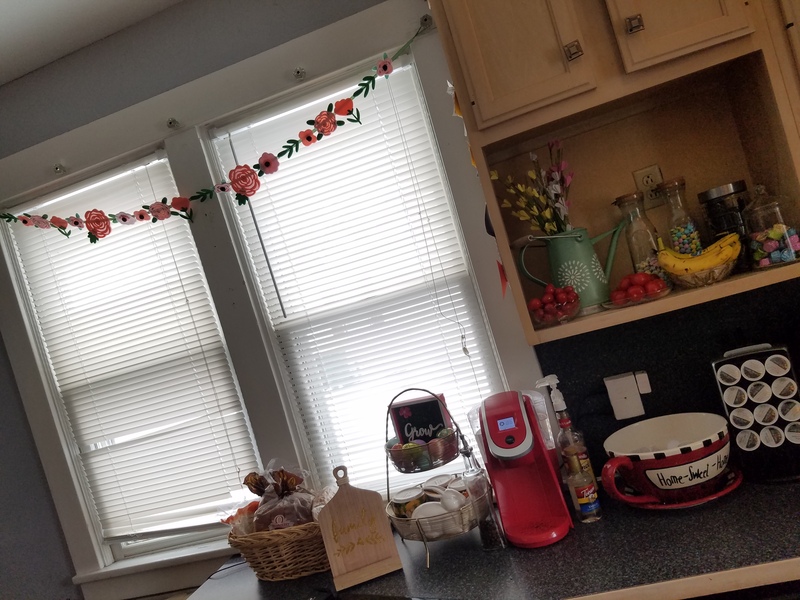 I hung a beautiful flower garland above my kitchen windows. 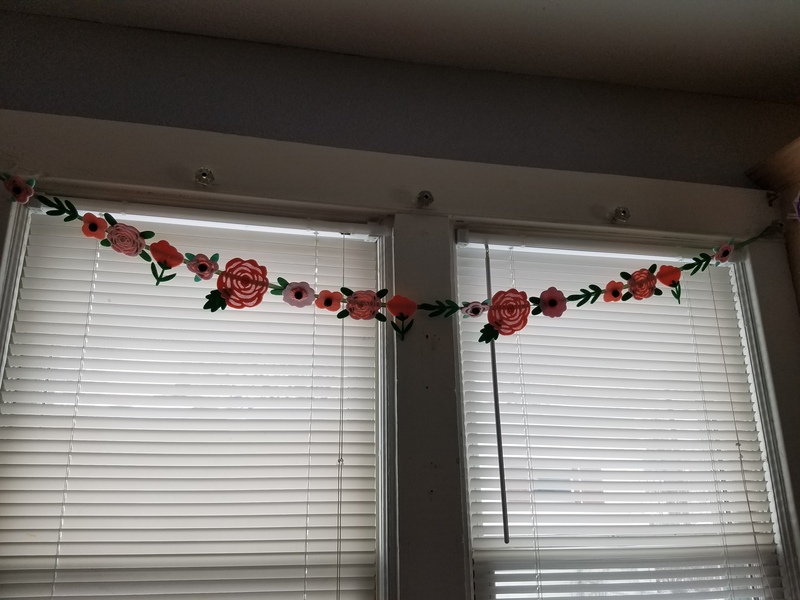 I found this garland in Target’s holiday section this year. 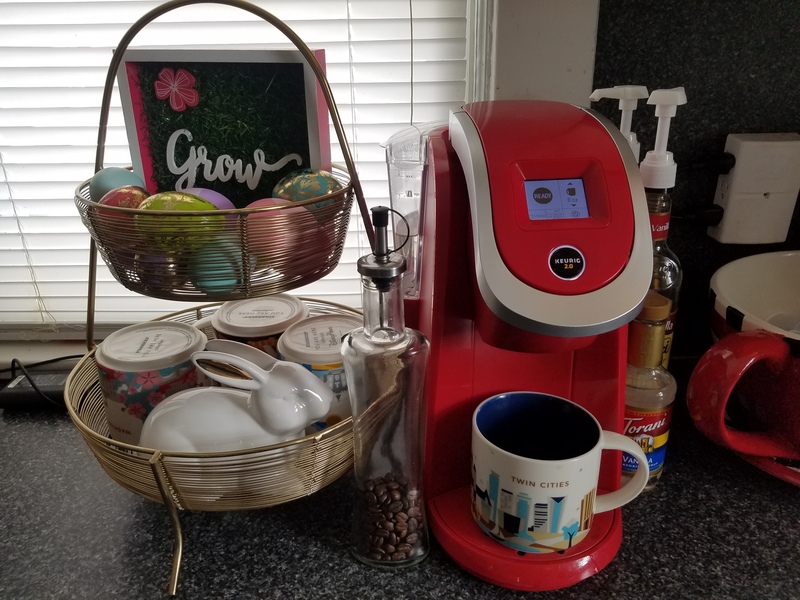 I have my two-tier stand with my coffee cups, which is next to my Keurig coffee machine. 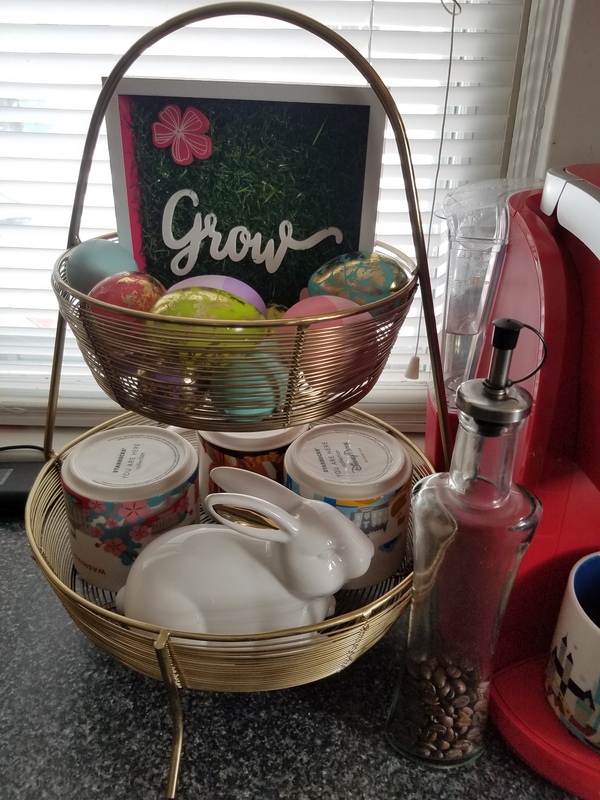 On the top tier basket is a grow sign with two different styled Easter eggs in different colors. 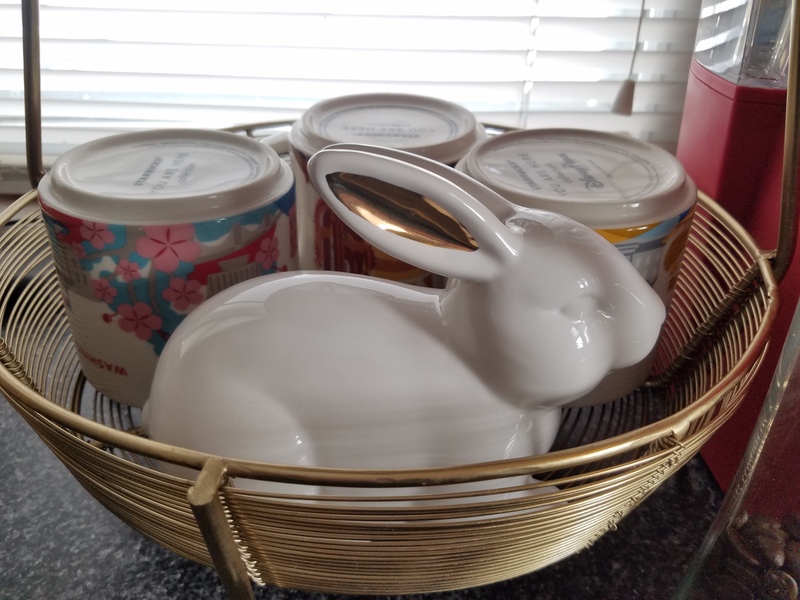 On the second basket are my Starbucks Wish You Were Here coffee cups and a ceramic bunny. 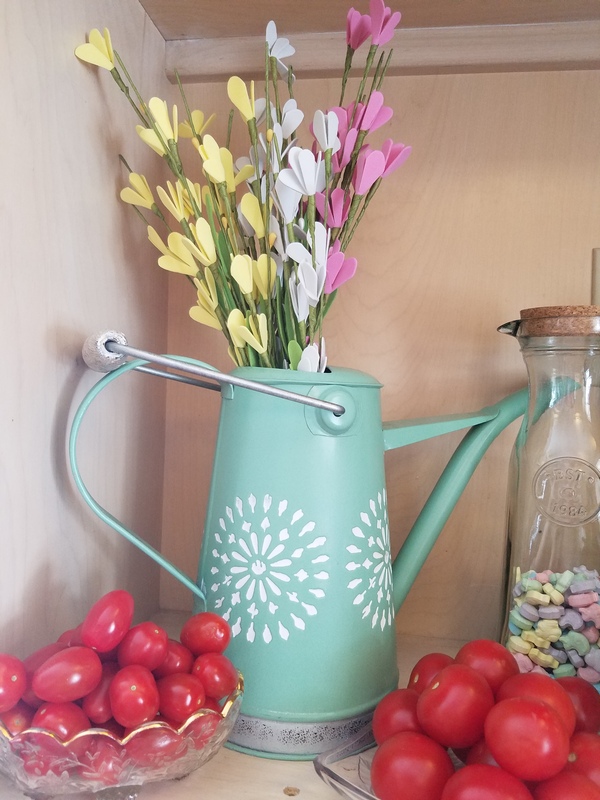 You can find all of these Spring decor in Target’s dollar spot section. 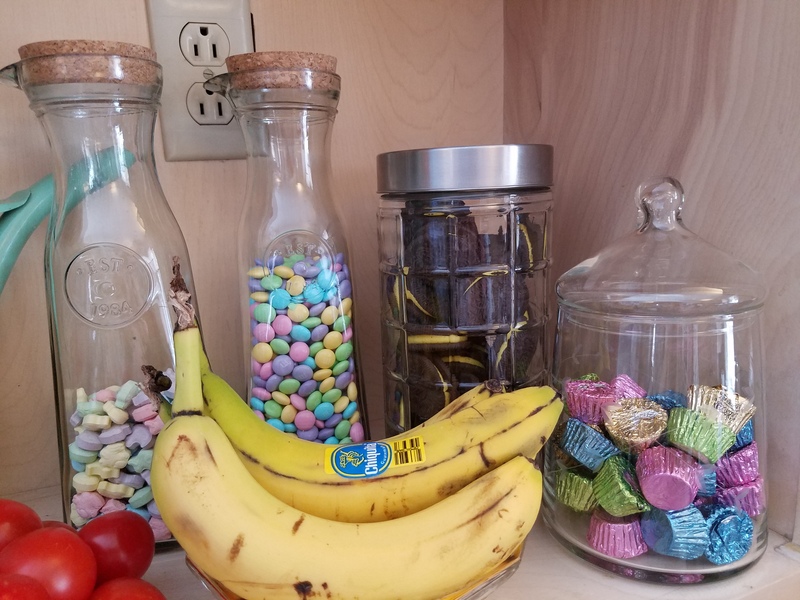 On the shelf above my coffee area is where I place any fruit, veggies, and treats. 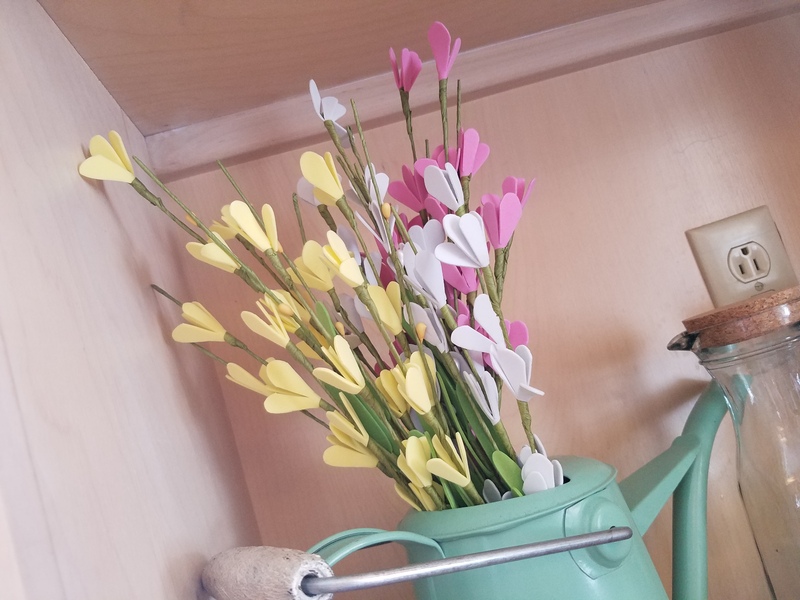 I added my watering can (bought at Target last year) and placed fake flowers to add a Spring touch. 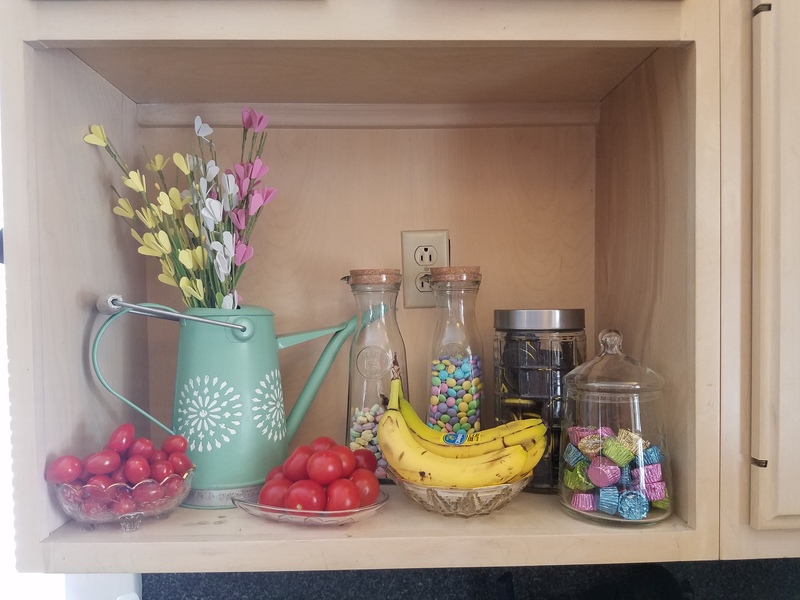 I bought several Spring treats to place in containers and display on the shelf. 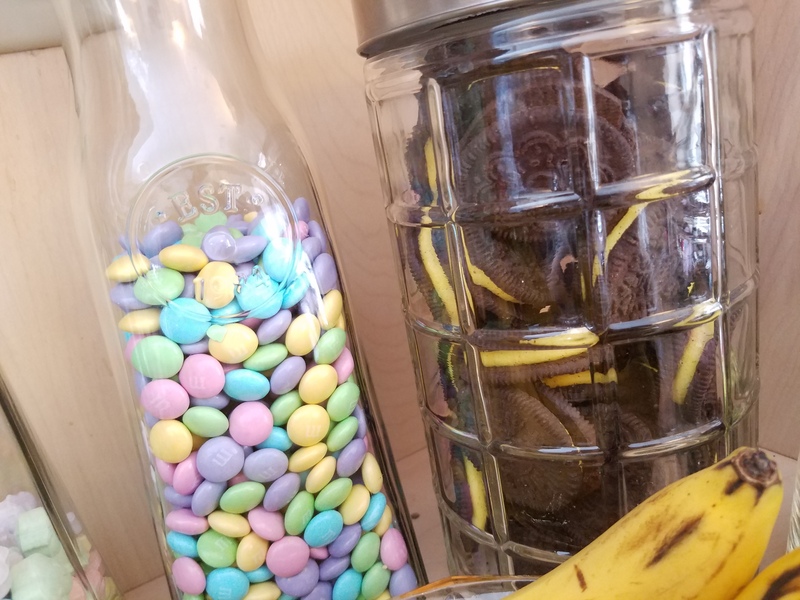 In the containers are Spring Oreos, chick Sweet Tarts (husband’s favorite), pastel colored M&Ms, and mini Reese’s cups. Also in the shelf are my tomatoes and bananas. 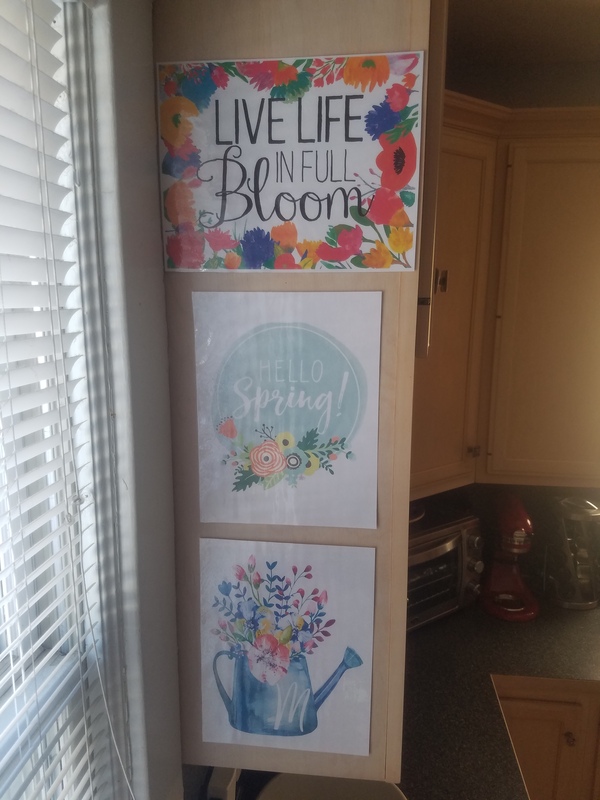 On the side of my kitchen cabinet, I displayed three Spring printables I found on Pinterest. I love the way they look together. 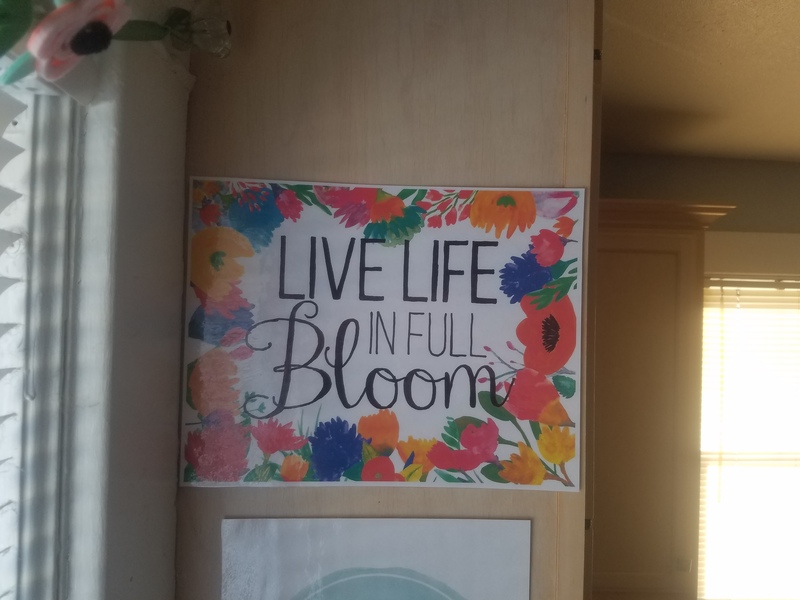 The first printable says, Live Life in Full Bloom, which is made by Jillian at Food, Folks and Fun. 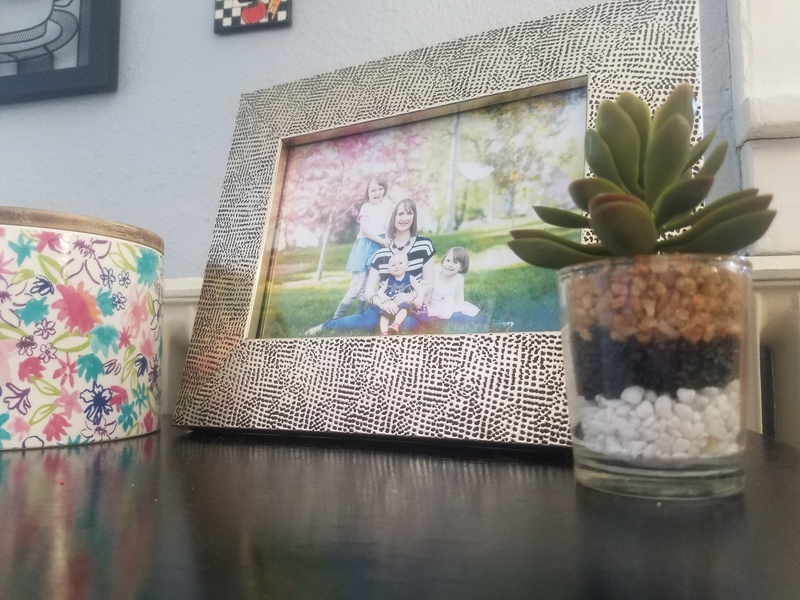 I loved the bright colors of the flowers around the frame of the printable. The second printable says, Hello Spring!, which is made by Landee at Landeelu. I loved the mint color of the circle and the pretty flowers. 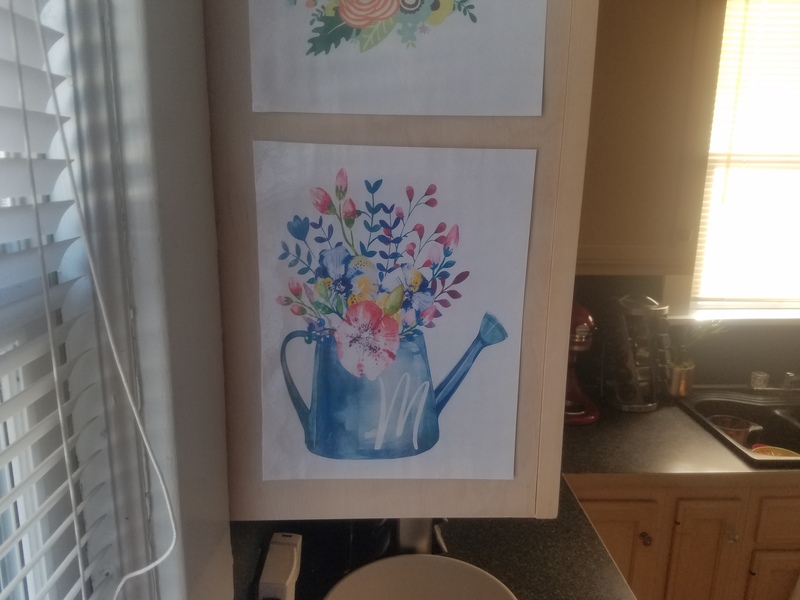 The third printable is a watering can with flowers inside, which is made by Linda at Burlap + Blue. I downloaded the printable with a letter M on it. I loved the color of the water can and the way the flowers looked with it. 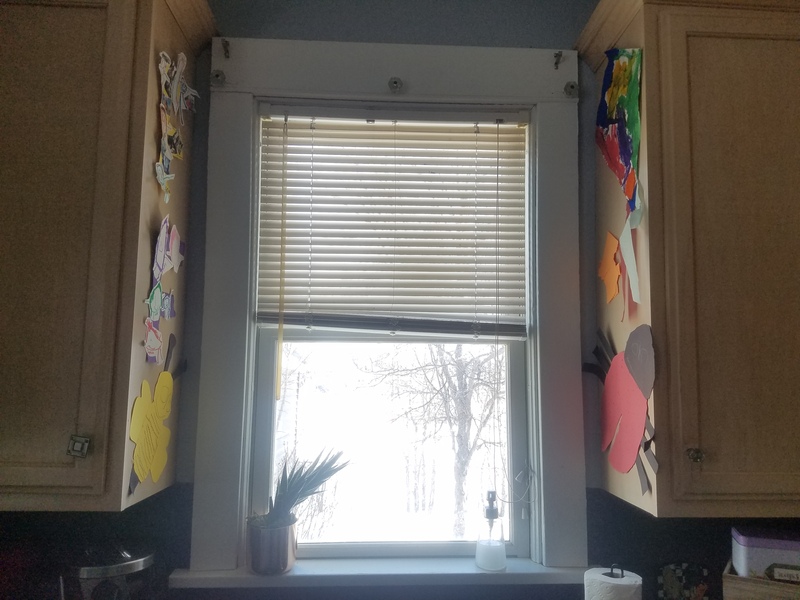 By my kitchen window, I have art displayed made by my girls, Katie and Sophia. Most of them Katie made in Preschool last year. 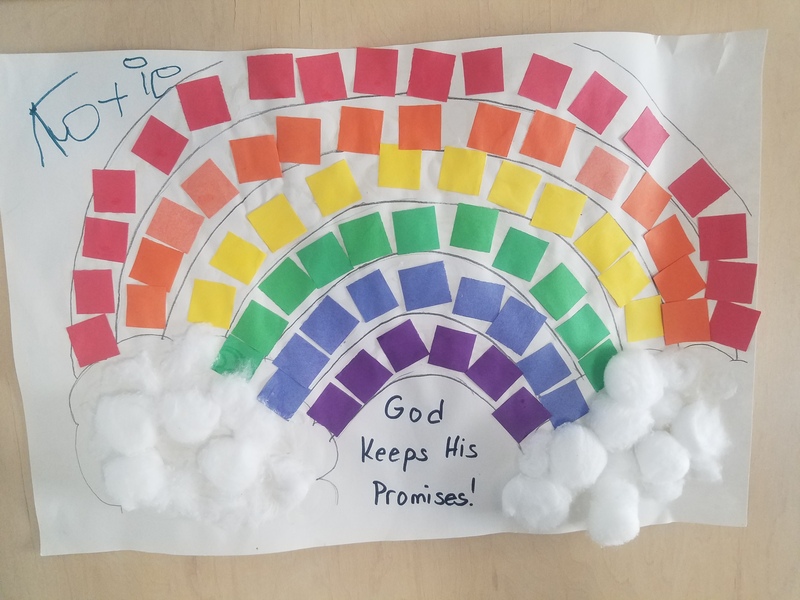 One of them Sophia made in Preschool this year. 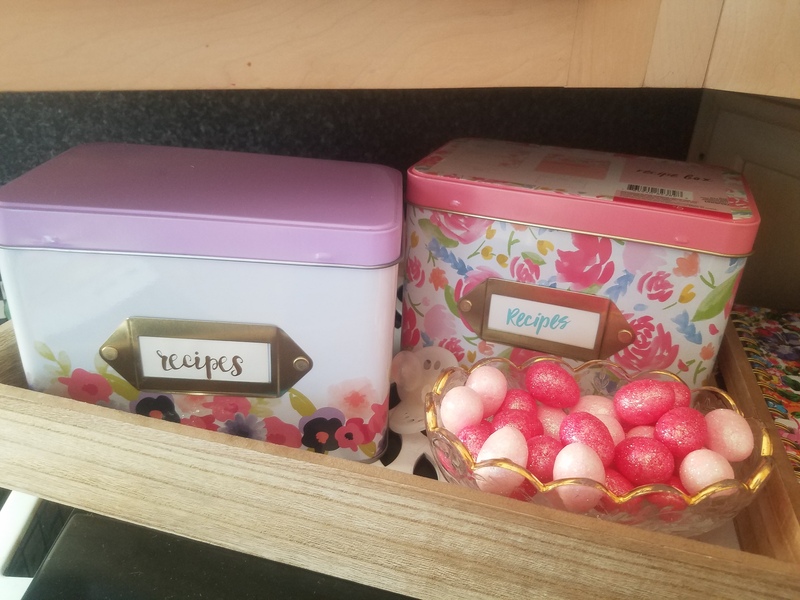 On my microwave are my recipe containers with floral designs and a dish with glitter eggs inside a flower tray. 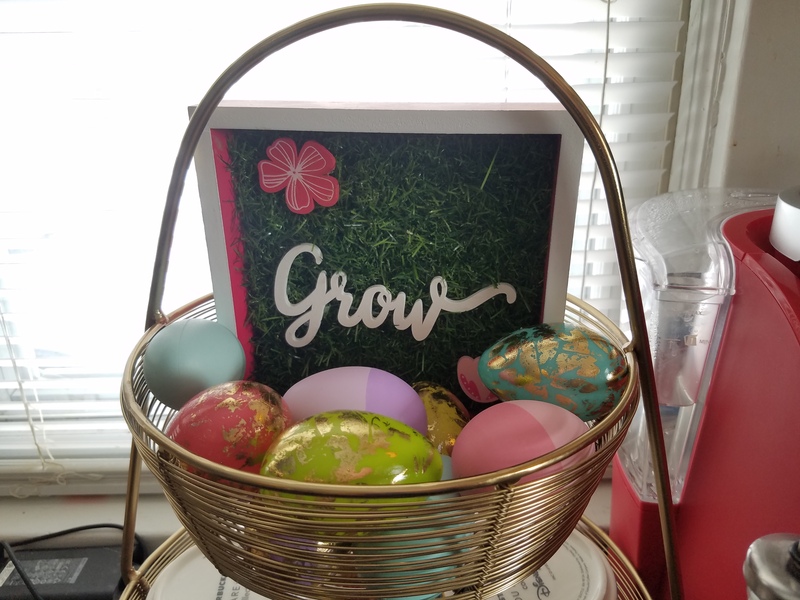 I bought these dark pink and light pink eggs at the Dollar Tree several years ago. 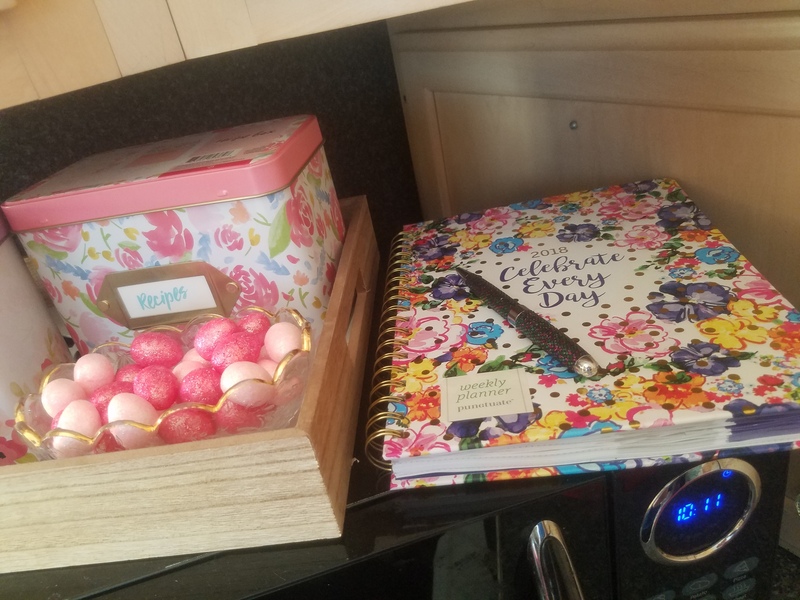 Next to the tray is my planner for the year with a Spring cover. 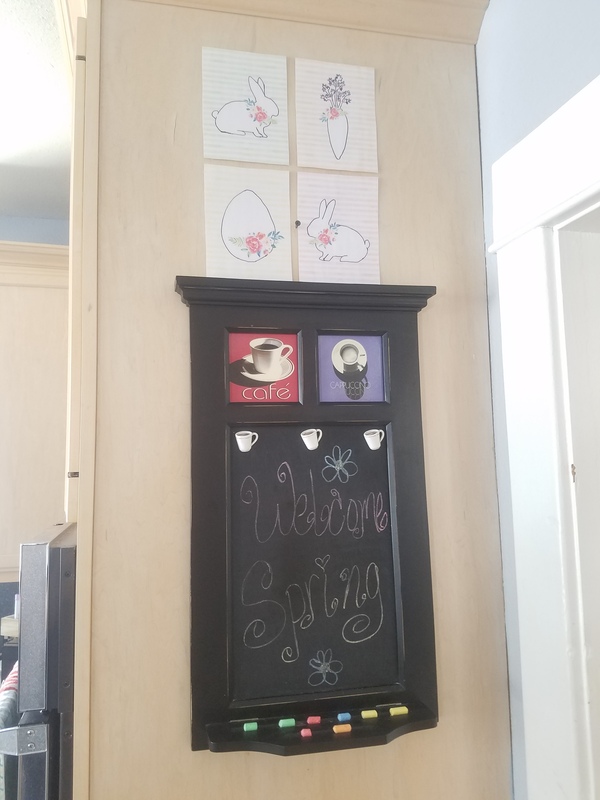 On the side of the kitchen cabinet (where my oven is), I have my coffee themed chalkboard, where I wrote, Welcome Spring. 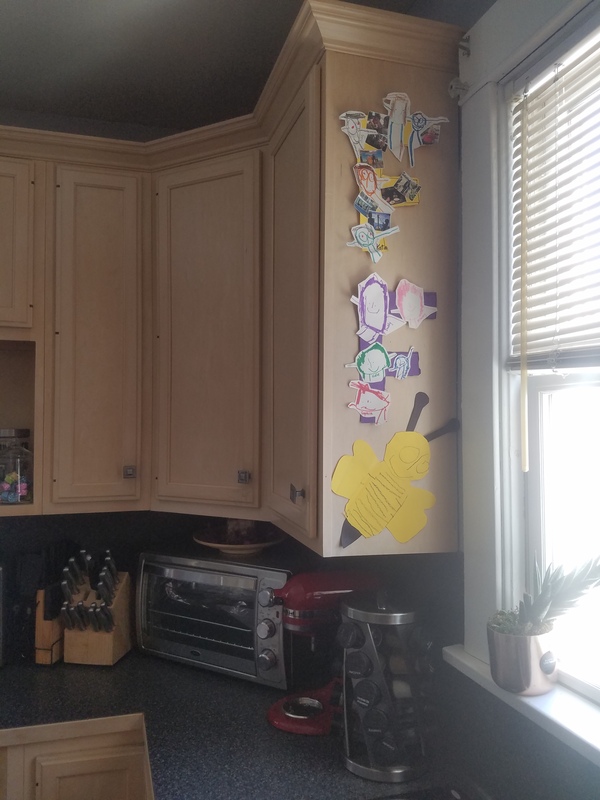 Above the chalkboard, I displayed an Easter collection printable, which is made by Andrea at The Cottage Market. 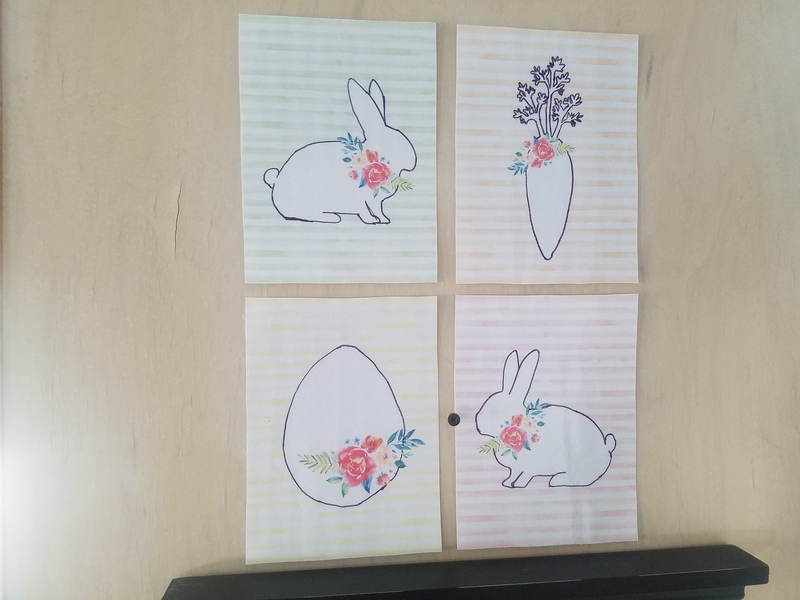 The collection comes with two bunnies, a carrot, and an Easter egg. I printed the collection in 5x7s and displayed the four printables together. I love how the four of them look together in a 2×2 layout. 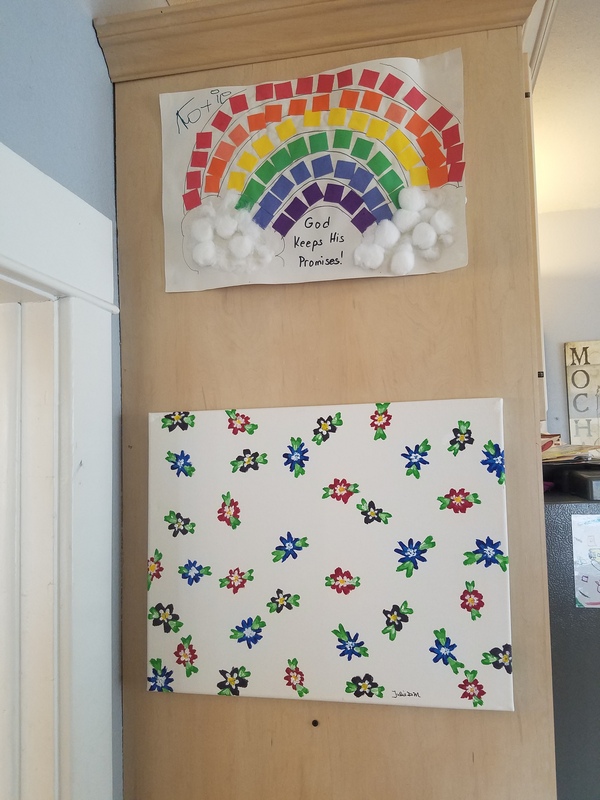 On the other side of the kitchen cabinet, I have a rainbow art that Katie made in Preschool last year. 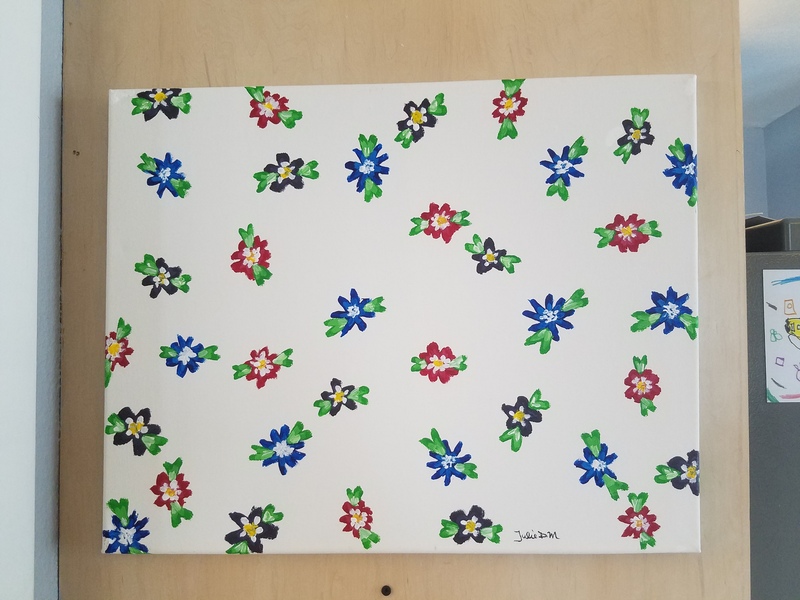 I also displayed my Spring floral painting that I made this weekend. I love how my artwork turned out. 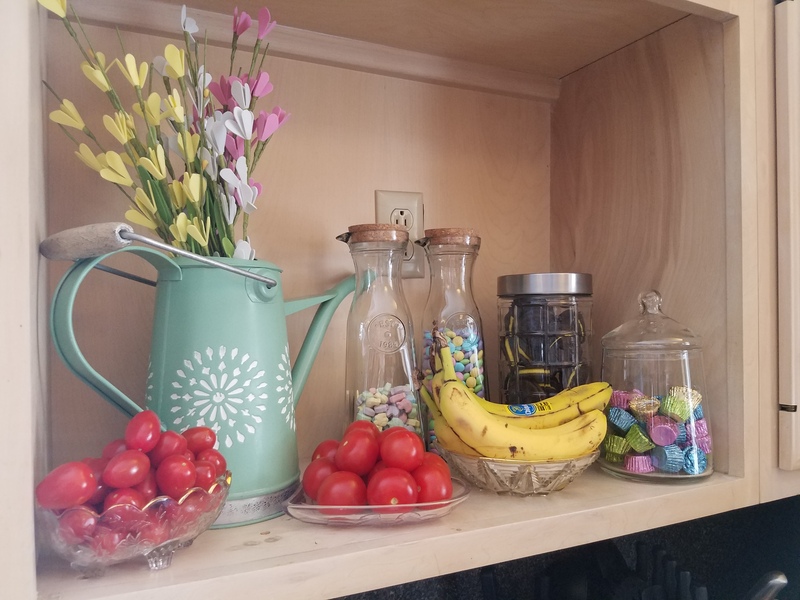 What’s your favorite Spring item in my kitchen? 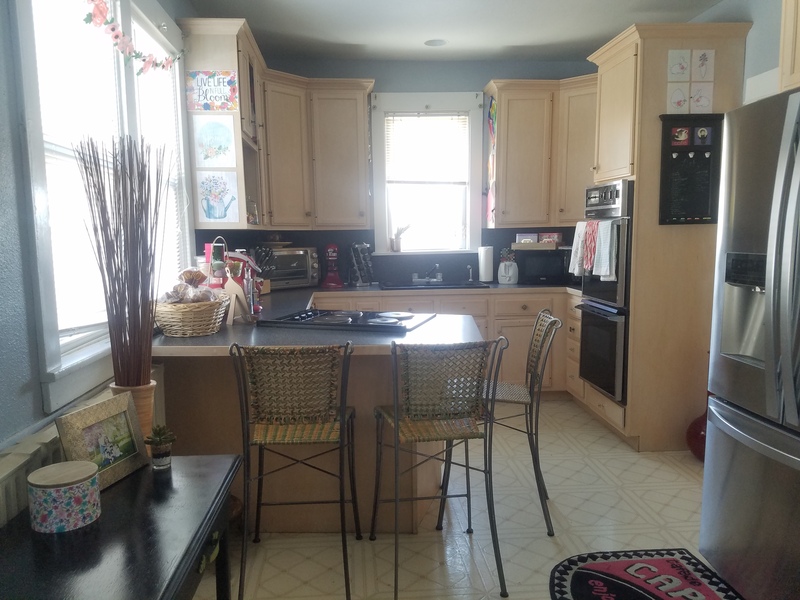 Does your kitchen look like Spring yet? Next Post I Now Can Read! I love the garland. Target is a great place to pick up cute holiday decor. 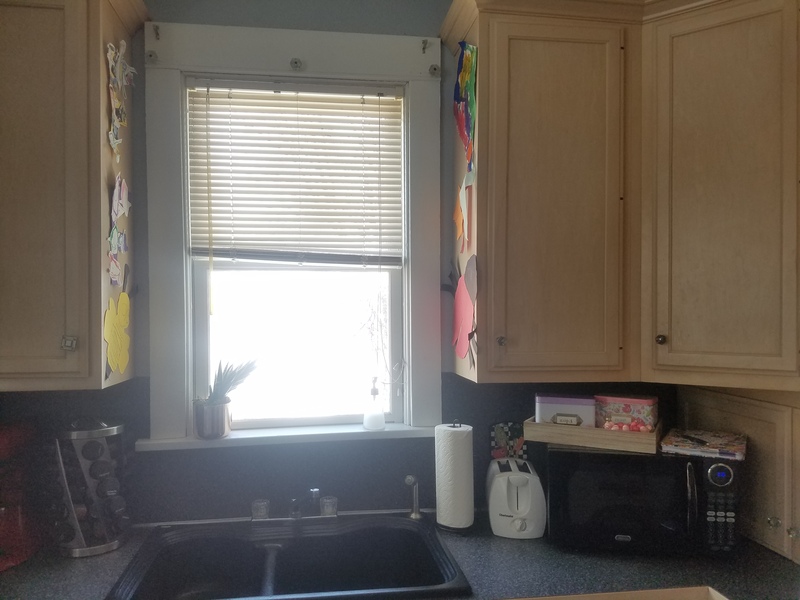 You’ve inspired me to get my house ready for spring. Thank you! 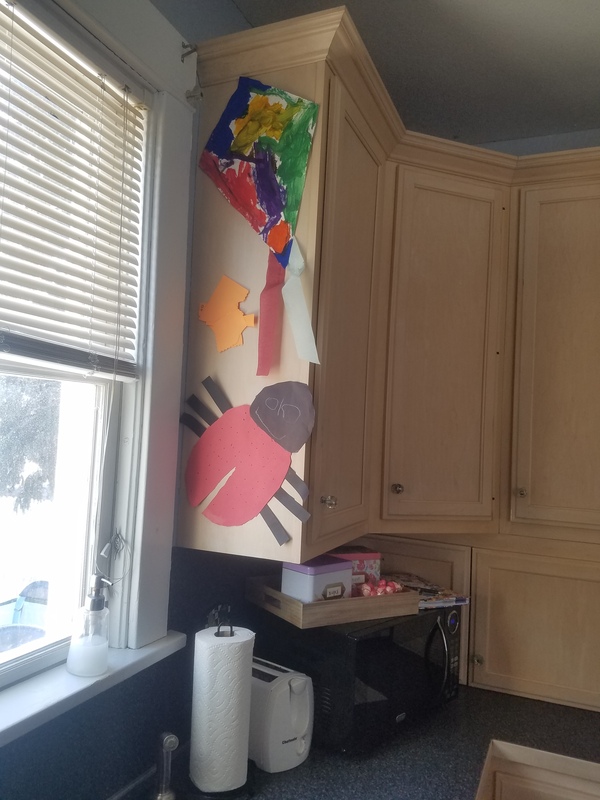 I love how you have the kid’s artwork displayed in your kitchen. 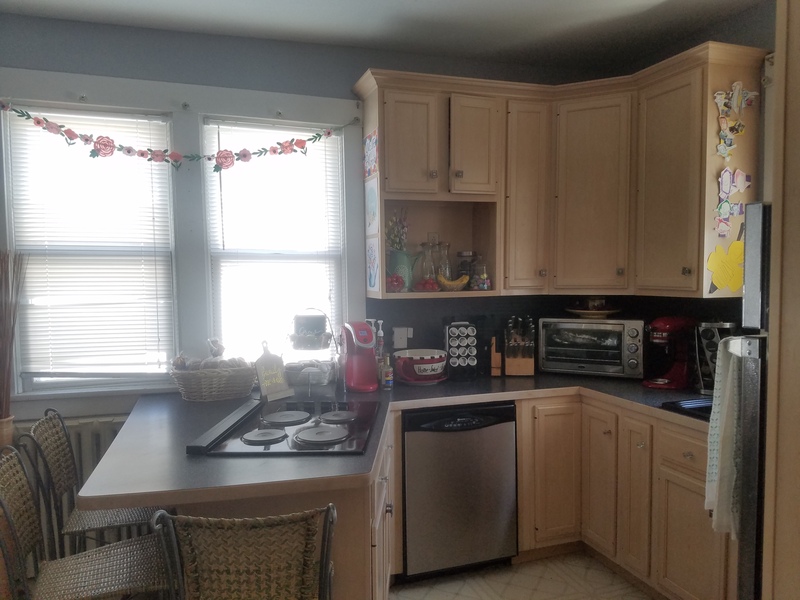 Your kitchen looks nice and ready for spring even if the weather does not agree. I love that little Target canister! Such a small, but fun, touch. 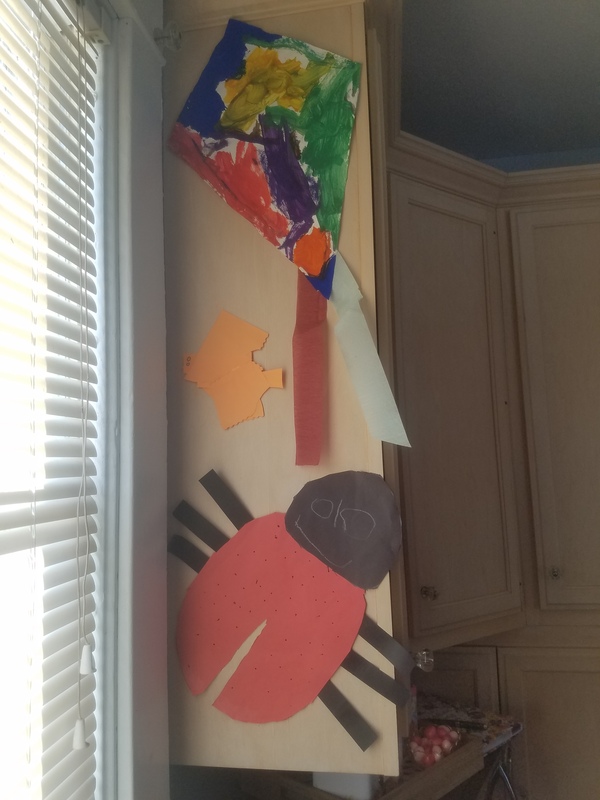 And I love the kids’ artwork. 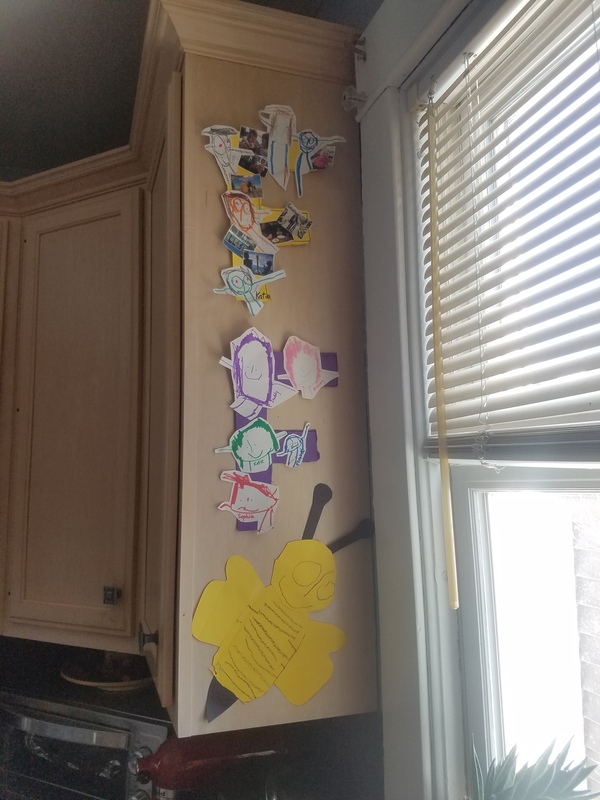 That’s all over my kitchen walls, too! We are still getting snow every day here! It’s hard to believe Spring is actually just a week away. You can’t go wrong in the Target dollar spot! 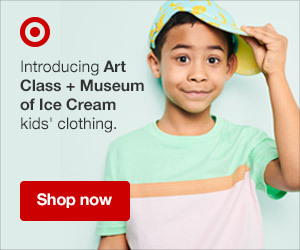 I love browsing it every time I stop by – there’s always a cute little item to pick up. 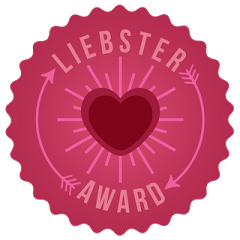 And I love your printables! 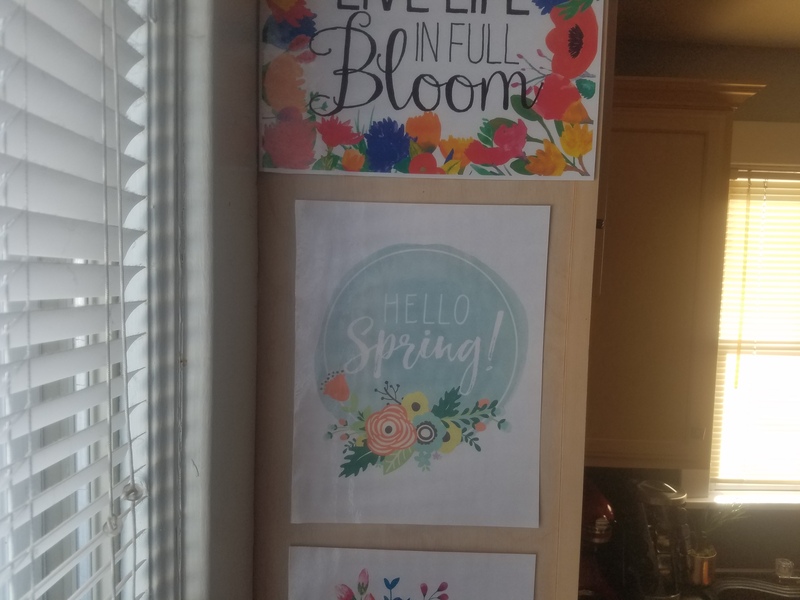 I had the Hello Spring hanging up in my kitchen last year! You did such a great Job.. 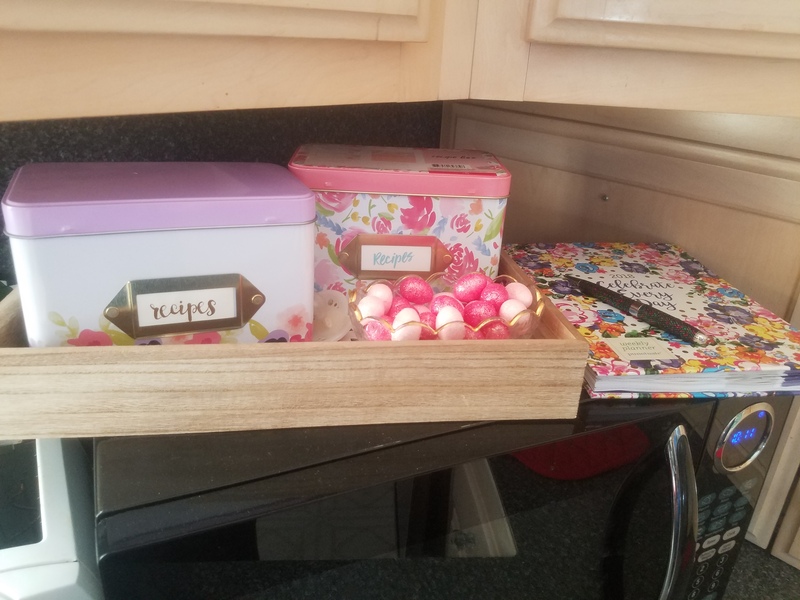 I totally love the printables! Love the decor, especially the flower garland! Definitely spring ready! 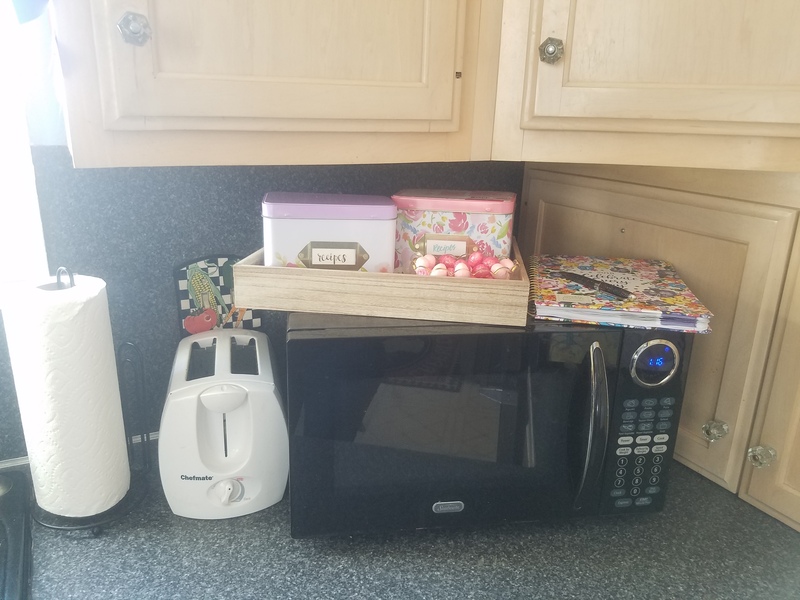 I love your kitchen set up, so cute! 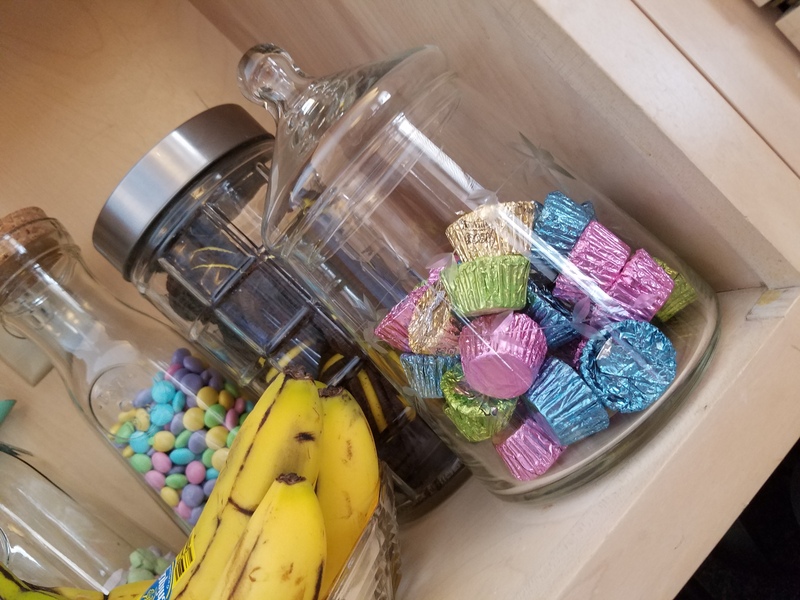 I really like how you displayed the candy! So creative! 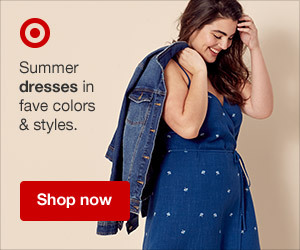 I have been loving the spring stuff at Kirklands, so you’ll have to check it out there. 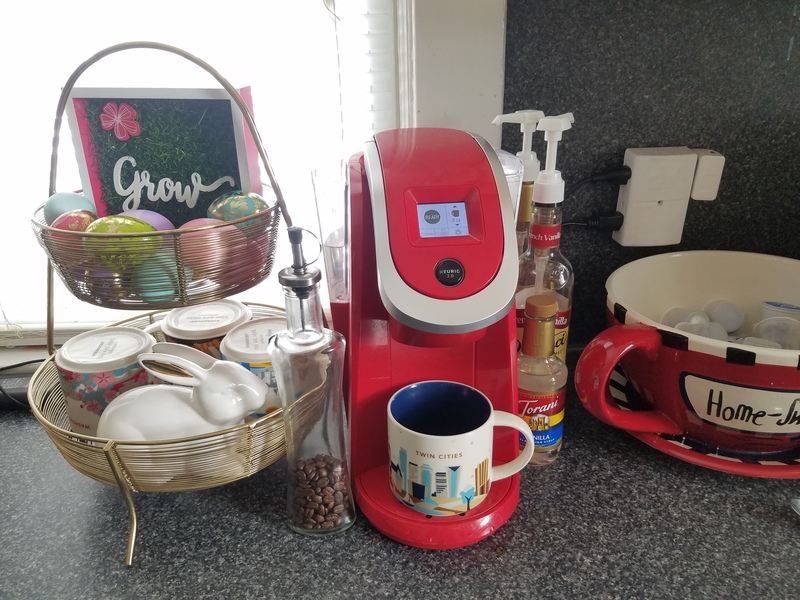 I *love* your coffee station area! The spring candies also are so festive! Thanks for sharing with Thursday Favorite Things, we are so happy you joined us ! I love the idea of decorating for the seasons and holidays. You really have some great things put up.